If God’s Kingdom is to advance on this earth the church must grasp these truths or the state will replace God as our lord and king and we will only have ourselves to blame. God Almighty owns everything. This is the biblical view: “The earth is the Lord’s, and all it contains, the world, and those who dwell in it” (Ps. 24:1); God says, “[E]very beast of the forest is Mine, the cattle on a thousand hills. I know every bird of the mountains, and everything that moves in the field is Mine. If I were hungry, I would not tell you; for the world is Mine, and all it contains (Psa. 50:9-12). God created mankind in His own image. Man reflects God’s character and order. Just as God owns everything, God delegated the stewardship and dominion of property to His image, mankind (Gen. 1:26-28), and thus humans have the capacity and calling to act as private owners. God planted a special garden—the Garden of Eden—and placed man in it to till it, and to guard its boundaries (Gen. 2:8, 15). When Adam and Eve rebelled against God’s law-order, God kicked them outside of those boundaries, and placed a “no-trespassing” sign in the form of an angelic guardian at their gates (Gen. 3:23-24). Adam and Eve very quickly learned the ins and outs of private property. This doctrine continued as God’s way of ordering and prospering society, and we see this in the fact that God’s fundamental laws for living—the Ten Commandments—include the prohibition of theft (Ex. 20:15). No man or group of men can take another man’s property—by individual act, legislation, petition, conspiracy, or appeal to the “common good”—in disregard for God’s law. The Old Testament frequently refers to the moving of a neighbor’s landmark (a property corner) in order to increase one’s own property (Deut. 19:14; 27:17; Job 24:2; Prov. 22:28; 23:10; Hos. 5:10). The references forbid or condemn the act as an attack on inheritance and possession (Deut. 19:14). The same doctrine holds in the New Testament. In the early Church in Acts 5, as many Christians voluntarily sold their goods and gave to the poor among them, one couple sold some land and laid only a portion at the apostles’ feet pretending they had given all. Nevertheless, even for these corrupt-hearted individuals, Peter up-held the doctrine of private property: “While it remained unsold, did it not remain your own? And after it was sold, was it not under your control?” (Acts 5:4). God punished them, not for not giving all, but for lying about what they gave. Socialism is the belief, therefore, that stealing is acceptable as long as another man or group of men says so. Socialism believes in theft by majority vote, or theft by a majority of representatives’ votes in Congress. Socialism is the belief that armed robbery is OK as long as you do it through proxy of the government’s gun. 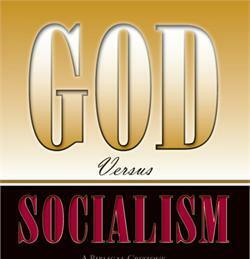 Socialism places man, and ultimately the State, in the place of God. Man becomes owned by other men, instead of by his Maker. Socialism is an entirely humanistic, God-denying, God-usurping belief. Between these two beliefs—private property and socialism— there exists fundamental conflict. They represent contradictory views of sovereignty, man, law, society, and inheritance. They are fundamentally rival religious systems. Choosing one, you reject the other; service and honor to God, or servitude to fellow men. Either God commands and judges man, or man commands and judges man. (Get the whole book, God versus Socialism: A Biblical Critique of the New Social Gospel).